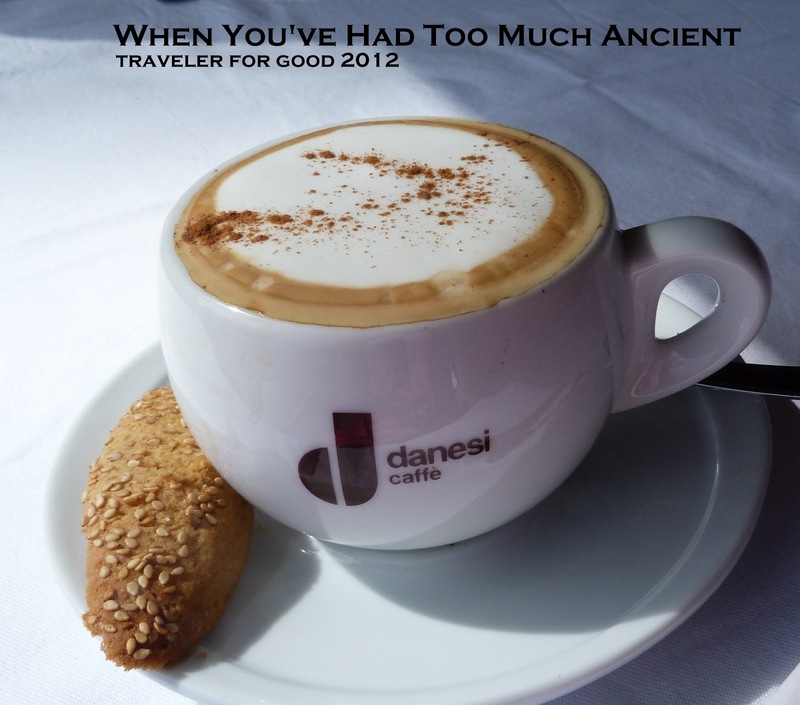 Traveler For Good: What to do with too much Ancient? When you travel a long distance from home or visit a famous place, you feel a lot of pressure. You feel that you should see and do all the "must dos." I'm not sure who's in charge of creating the "must do" list. All I know is that he/she does not allow enough time for just sitting (or standing or lying) around and enjoying. There isn't enough time for sunsets. Or ice cream. Or night markets. You might be in Yellowstone National Park. You know you should go see the bubbling mud. Instead, you'd rather sit on a rocking chair at the lodge and drink a bottle of Moose Drool. You might be in be in a famous museum. You should be paying detailed attention to each piece of art. What if you miss the famous lilies - night - ship - lisa? Instead you'd rather be enjoying the view from their rooftop terrace. I had this moment in Greece. We saw a lot of ancient over the course of our trip. After visiting the famous Knossos palace on the island of Crete, I had had enough ancient. I didn't want to look at the ruins. I didn't want to look at the gift shop. I wanted to sit in the sun on a patio, drinking cappuccino, and just simply enjoy being. Being in Greece. Being on Crete. You are the one in charge of your destiny. Captaining your own ship. Picking your own cliches. Your friends, family, tour director, boss, the media and prevailing wisdom can dictate what you should do with your life. Your time. Your money. But it's up to you. Find your cappuccino.